How do I check-in? Do you have a front desk? Self Check-in! You will receive an email and text with your door code the morning of check-in. Check-in time is any time after 3pm. LOLOMA LODGE will make every effort to honor special requests (such as a specific house number, adjoining rooms, etc.) upon your arrival. Can we come in earlier than the standard 3:00 PM check-in time? We may be able to adjust our standard times with advance notice and additional charge. There are times when an earlier check-in is possible. If there is a group checking out on the same day you arrive, this is NOT possible. You must email in advance for early check-in / late check-out. A $50 fee may apply. Pets are allowed with a $25 non-refundable pet deposit, per visit, per pet. Please select number of pets as an add-on option in the booking checkout process. If you have any questions about breed or species exclusions, please do email us. Pet acceptance is approved on a "case by case" basis (a fine of $250.00 will be applied to the bill if a pet is discovered). “Service animals” are allowed with proper documentation. Mostly we're concerned about our free-roaming chickens, one of which has been the victim of an over-excited dog. Regardless of breed, the chickens are irresistible to chase. If your pet harms a chicken, there is also a $250 charge. While many of our fur visitors are welcome to roam free, we encourage you to keep them on a leash if they tend to escape or are aggressive or overly playful with scared animals (human or otherwise). As a small resort, we depend greatly on pre-booked occupancy and need to stay as full as possible to keep our doors open. That being said, we understand that emergencies do occur and we try to our best err on the side of fairness and working things out. If you need to cancel or reschedule your stay, we have established a policy that we hope you too will find reasonable. - 100% refund for any changes (cancellations or reschedules) made at least 14 days in advance. - If you need to make changes within 14 days of your arrival date, we don’t have much time to find someone else to book your room(s). We hope you understand that this puts us in a bit of a bind. What we offer in this scenario, is a 90% refund if we are able to book the room(s) anytime up to your scheduled date of arrival. You are welcome to refer friends + family and we will be sure to welcome them with whatever seasonal promotion we have going on. Unfilled reservations are subject to a charge of one night's stay plus tax. Smoking is prohibited in all public areas of the hotel and in “non-smoking” rooms, including rooms with a balcony (a $250.00 fine will be applied for smoking in a non-smoking room.) Smoking is allowed in designated “smoking” areas of the property with proper removal of butts. LOLOMA LODGE enforces a NO IN-ROOM PARTY POLICY to ensure we can protect the hotel and our guests at all times. In the event of a disturbance one warning will be given to reduce noise. If this warning is not followed, the guest will forfeit all fees and must leave the property immediately. There is a 10:30pm noise ordinance for amplified sound. What is stocked in the cabins and what should we bring for the stay? We’ve got you covered - all you need to bring is food/drink and YOU! Our kitchens are fully stocked with plates, utensils, and any cookware that you can think of. We also have essential spices and everything you need to clean up after your meals. The bedrooms and living spaces have a plethora of bedding. There are even have toiletries in each bathroom in case you forget yours! Do you have BBQ’s for our use? Yes. We have several gas grills for you to use, propane included. You are also welcome to cook over the campfires! Our 5 mbps WIFI covers the entire property. WIFI is accessible upon entering the property, no password required. You should be able to check your reservation online or via email. Do you have television reception? Do you have cell phone access? Your cell phone access will depend on your service provider. Word in the 'hood is that Verizon seems to be best up and down Hwy 126. We have found that some guests have adequate service while others do not. Please bring your cell phone with you when you come for a tour so you can test service if this is something you really can't live without. Yes, we have washer/dryer facilities on site for weddings in the Bath House, down by the cabins. How long does it take to get from Portland to Loloma Lodge? From Bend? From Eugene? The Lodge is approximately one hour from Eugene or 1.5 hours from Bend via Highway 126. We are about 2 ½ hours from Portland. What is the weather like right now at Loloma Lodge? Easy enough, check out the Weather Forecast and Conditions. Also, be sure to keep an eye on road conditions through TripCheck so you know when to bring your tire chains! Is Loloma Lodge open year round? Yes! We are available for winter outings as well as summer, fall, and spring. Connecting with friends and family is fabulous no matter what the weather. Loloma is now offering retreats (yoga, artist retreats, biking, etc). EMAIL visitloloma@gmail.com to start a conversation. Loloma Lodge is famous for its spring water. Many people come with empty jugs to take it home with them. Please note that massive amounts of water bottles create an environmental hazard. Please bring reusable bottles and fill them with our wonderful spring well water. Do you have a Lost & Found? How can I get my item back? Please email visitloloma@gmail.com and describe what you're missing. There is a $15 fee plus USPS flat rate postage fees for mailing an item to you. We hold a lost-and-found item for approximately 30 days unless it's super cute. The Lost & Found return process is slow - thank you for your patience while we get your items back to you. We only have private, invitation only events. We are getting our ducks in a row for some great public events - We're thinking music, food, film screenings, biking, etc. As a wedding venue, Loloma Lodge is popular for weddings because we offer a private lodge experience. Your party will have use of the entire resort for your private use! How do I book a wedding ? Please come for a visit to see if Loloma is a good fit for you! 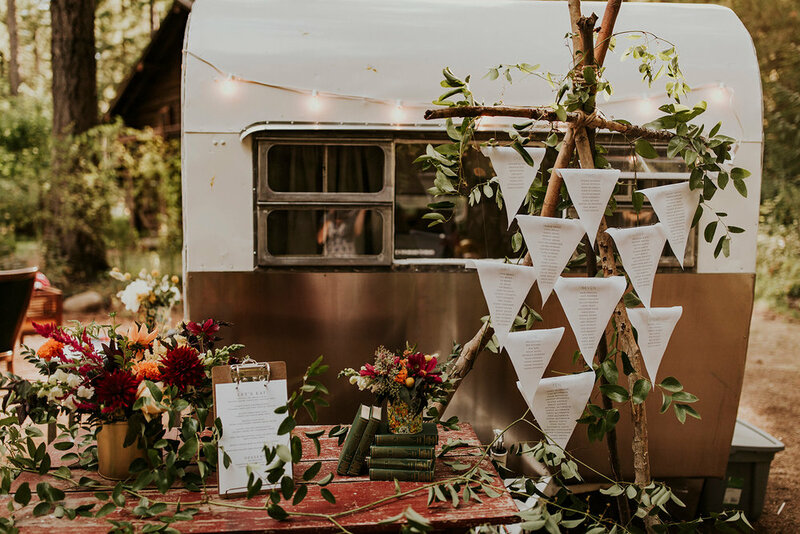 In addition to the lodgings, take a look of our reception site, riverfront ceremony, gardens, and catering kitchen to get an idea of all that we can provide. Weekday elopements start at $1,500 and summer weekend rates start at $10,000. Deposits of $2,000 are required to reserve a date. Deposits are non-refundable but may be applied toward future lodging. There are SO many more details to discuss - if you're interested, send an email my way! When you book the entire property + lodging, we supply tables and chairs and exclusive use of the facility. You have full access to the Classic Log Lodge and cabins, kitchens, recreational areas, the entire grounds, ceremony site by the river, garden, lawns and wooded areas, outdoor fire pits, covered stage, carriage house, and more. Please contact us for an inventory list. Please note that lodging is in addition to the wedding fee. How do I arrange for a tour of Loloma Lodge? Send us an email and let's make an appointment for a tour! We will find a time when all of the facilities are available for you to see. Please do not “drop by” without notice, as the lodge may be booked with other guests or staff may not be on site. Do you have a prep kitchen? We have a catering kitchen that has a commercial dishwasher and commercial refrigeration (no range/oven) In our catering kitchen you will find china and flatware for 150 people. There are also kitchens in all of the lodging buildings (which include range/ovens). We have 2 large commercial gas grills on-site as well.